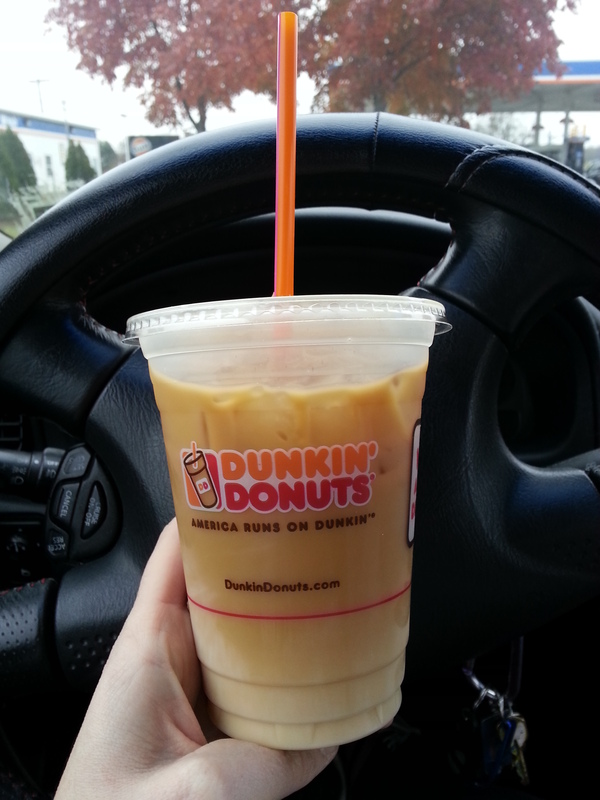 One quick stop at Dunkin Donuts and I was fueled for the mission! I'm a fan of this Goodwill because it's huge and they have tons of clothes and fitting rooms if you're bold enough to try them on. When I pulled up I saw this sign that said, "GRAND RE-OPENING" so I had high hopes. I was completely SHOCKED when I walked in because the entire store had been rearranged! Books are now in the front of the store and sorted by style, genre, and author. The knick knack and random thing section was relocated to the back of the store and contains less items. They also created a section devoted just to Christmas Decorations! I am hoping this is going to be the seasonal section and it just so happens they are into Christmas now. Nothing would annoy me more than going there in June and seeing an entire Christmas Decoration section. There was a sign that stated, "50% off BLUE tags" The problem was that most of the items were without tags. The thing about Goodwill is that they have set prices. For instance, all long sleeved ladies shirts are $3.99. If I'm getting a name brand shirt I really feel like I'm getting a deal but if I get something that's not a name brand I feel like it's just an average deal. I didn't find any UGLY sweaters in the whole place but I did manage to pick up 5 long sleeve shirts. NY&CO, Apt 9 (I think this is a Kohl's brand), Calvin Klein, Perry Ellis, and my funky find of the day that had no tags! When I saw this shirt I had to have it. Then I searched through it for some kind of tag to let me know what size it was or how to wash it and I got NOTHING! Luckily it fits and I'm going to gamble safely and wash it in the machine on the hand wash setting. Checking out was a bit of a nightmare because the place was so crowded and I think the cashiers were all new. 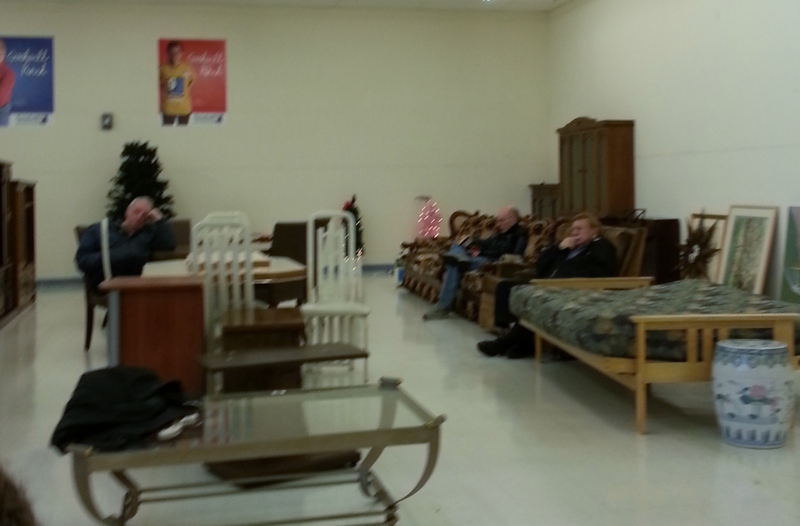 You could see a lot of the older woman brought their husbands and they had the right idea of hanging out in the furniture section while they waited. I left Goodwill a happy hunter even though I didn't find an UGLY sweater. 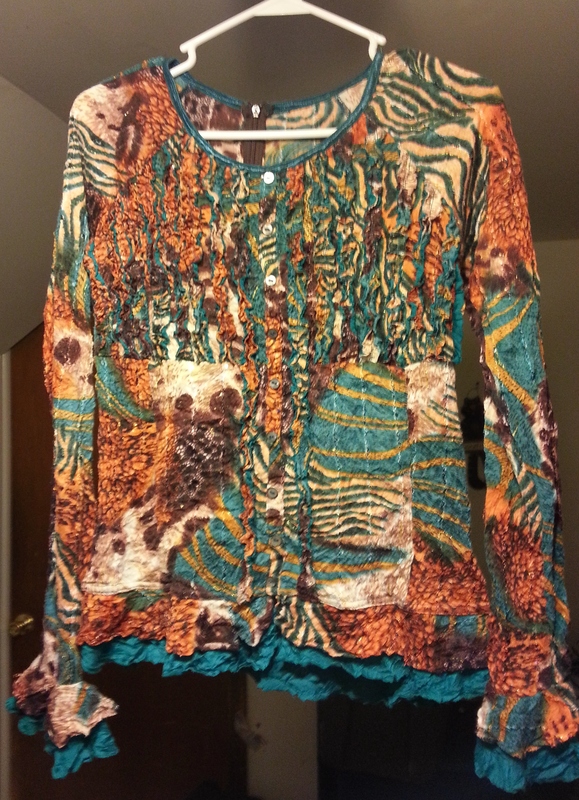 I got a great deal on 5 nice shirts for $19.95, one of which was my funky find of the day ! SECOND STOP: Red White & Blue Thrift Store on RT 73 in West Berlin, NJI've had some success at this place in the past when it comes to finding a dress to wear to a wedding or finding a some get up for a murder mystery dinner so I drove here feeling like this was the place I was going to find my UGLY sweater. As soon as you walk in this place you are greeted by the largest most overwhelming selection of used shoes on the left. They are arranged by color but there's hundreds of them! I walked in and was excited to see that EVERY TAG was 50% off EXCEPT blue tags. As I started walking around I noticed that just about every tag was blue and the ones that weren't were over priced! I felt like everything in this place was over priced and that they priced according to the brand. The other thing about this place is that they only take CASH but they do have an ATM in the store . 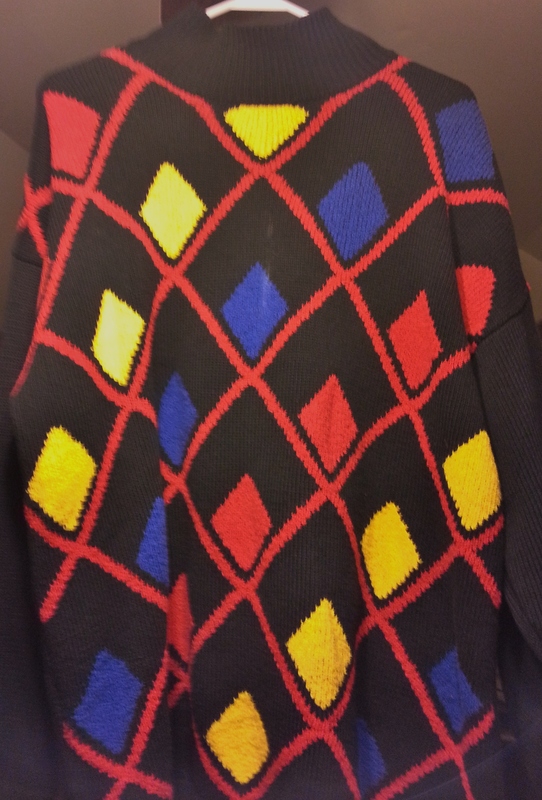 All gripes aside, I did manage to find a sweater that's pretty UGLY for $3.95 and that was a blue tag. I think I may add some Christmas Decorations <cringe> to it to make it look uglier. Maybe some dangly balls and lights and garland. This would be good for the party but for the run I can't have dangly balls so I'm still in the market. I also made an impulse purchase of a Talbots dress that had a white tag of $9.95 so it came out to be a more acceptable $4.98. Overall the Red White & Blue Thrift Store isn't a terrible thrift store, it's just not my favorite. 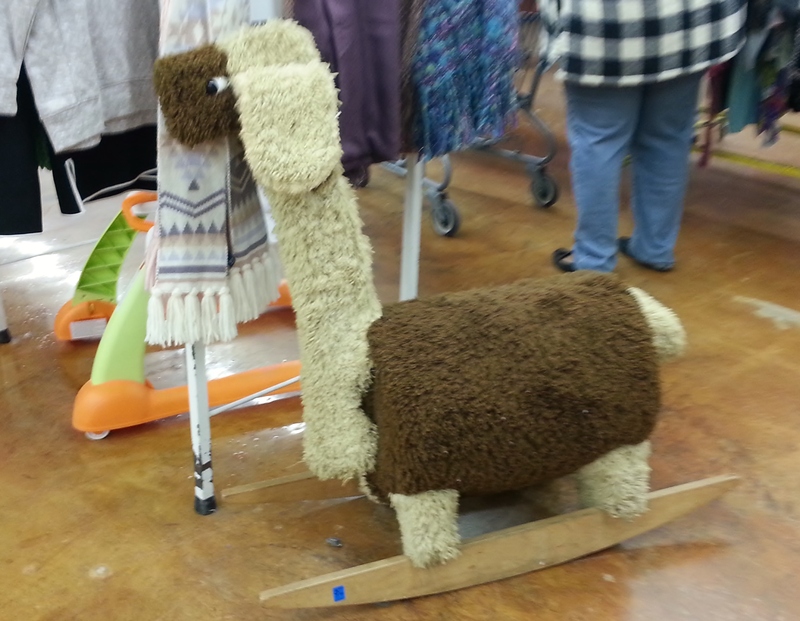 This is a thrift store that you can go to and wander around for an hour and be amused by the really weird random things that you wouldn't buy. Like a shaggy rocking animal. It's not a place I would go to and expect to get a great deal on an every day item. White & Blue Thrift Store. A woman in a car approached me and rolled her window down and said, "Hey, there's another thrift store on Berlin Cross Keys down the road. Take this flyer and you can save 10% off your purchase." I looked at the flyer and it was for Family Goods Thrift Store ! I was already planning to make a return visit to this place my last stop so that was icing on the cake! When I walked in there was a sign 35% off BLUE tags and 15% off YELLOW tags so for me that meant 45% and 25%. I was also greeted by the familiar sounds of screaming children that resonated with me from my first visit. It sounded like a birthday party was going on and then it was confirmed when I heard the group singing Happy Birthday, with the appropriate Cha Cha Chas. It was almost unbearable at one point but I shopped on. This place is small so it wasn't ideal for looking for an UGLY sweater. I did find a shirt with a final price of $2.13 and a dress with a final price of $4.41 so I feel like it's still a place where you can get great deals. When I checked out the cashier was the friendliest person I'd encountered all day. She told me the place next door was a Parkour facility! Apparently, they do birthday parties on the weekends. I like Family Goods Thrift Store as a place to find a good deal. It's not a really big place so you won't find a large selection but the items they have are reasonably priced and the pleasant customer service is a nice surprise. which was the main thing I was looking for. 1 Comments To "3 Thrift Stores in 3 Hours"